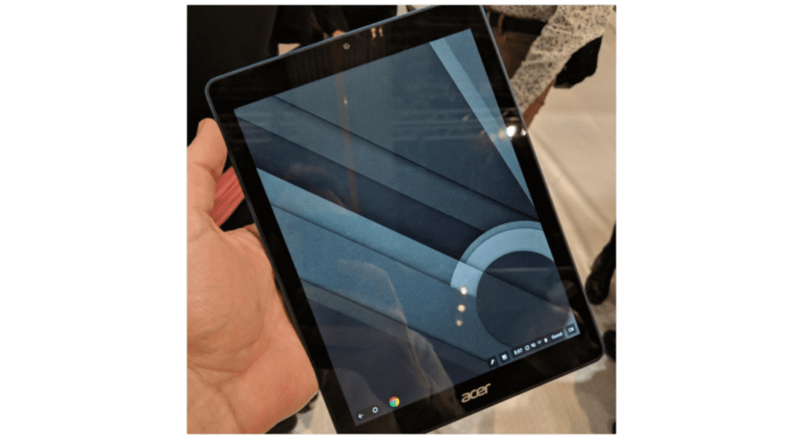 Did Acer Just Out The First Chrome OS Tablet At BETT? The annual BETT show is well underway in London and while we’ve seen some fairly expected Chromebook announcements, news just rolled across my Twitter feed that completely blindsided me and I am STOKED! Thanks to a tweet from Alister Payne(@Alister_Payne), we now have an image of what appears to be an Acer tablet running Chrome OS. Check out the tweet from the show floor of BETT 2018. From the looks of it, the Acer is likely an 8″ to 10″ display which falls right in line with devices we have been tracking. I was unable to get any details on specifications but we do know that the tablet had a companion stylus from the popular pen company Staedtler. I could easily see this tablet being an addition to Acer’s Iconia lineup. The timeline is just about right to make this tablet the RockChip device ‘Scarlet’ that we have been tracking since this time last year. This tablet isn’t on display and as far as we know, no official announcement has been made but the fact remains that it’s there, in the flesh. Chrome OS tablets may be closer than we ever thought and that’s some very exciting news.